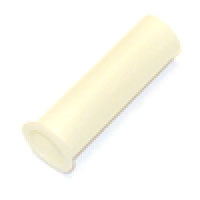 Plastic coil sleeve, 2-3/8 inches (60mm) long with 5/8 inch (15.5mm) outer diameter, for use with large-bore coils as used on drop-target banks on older Bally and Stern pinball games. Fits coils such as B-27-2300, NO-26-1900, NB-26-1900, NO-27-2300, NO-24-1400, and similar. 9/16-inch inner diameter, 5/8-inch outer diameter. Slightly longer than some originals- trim to fit if necessary. Also replaces Williams # 2A-2168.